Running to New Heights… Across a Suspension Bridge! 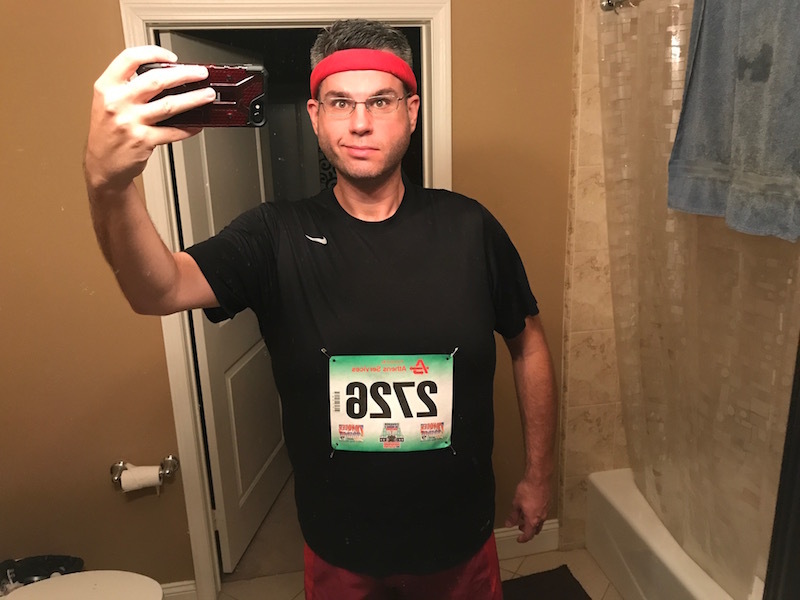 (Conquer the Bridge Race Recap) | Keep It Up, David! You know it’s going to be a good day when you’re pinning a race bib to your shirt at 5:30 am! 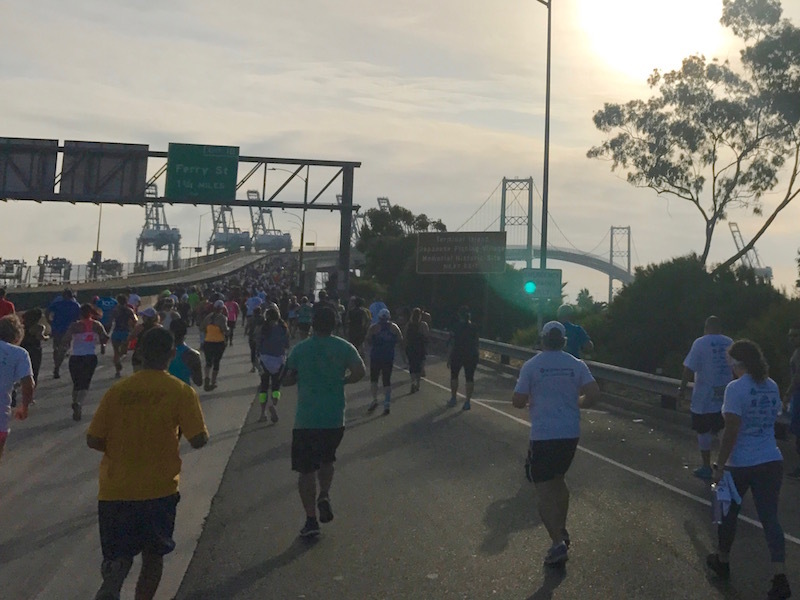 I’ve done a few running races this year (like the 10K Pride Run and the 10K Coaster Run), but I was much more excited for this race – because it was in a location that, the rest of the year, is completely closed to pedestrians: the Vincent Thomas Bridge. 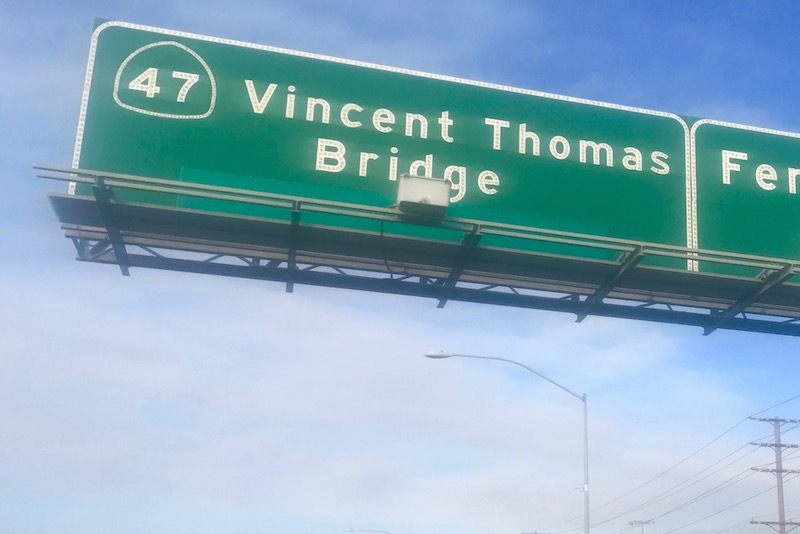 The Vincent Thomas Bridge is named for the California state Assemblyman who fought for nearly 20 years to have it built. It crosses the Los Angeles Harbor, and while it’s a big, impressive feat of engineering, it’s by no means a record-holder. There are literally 75 longer suspension bridges around the world. The bridge looks even bigger, though, just before you’re about to run over it. In total, the bridge is over a mile long, and the main span, between the two towers, is 1,500 feet. At its highest point, the road on the bridge is 185 feet above the water. 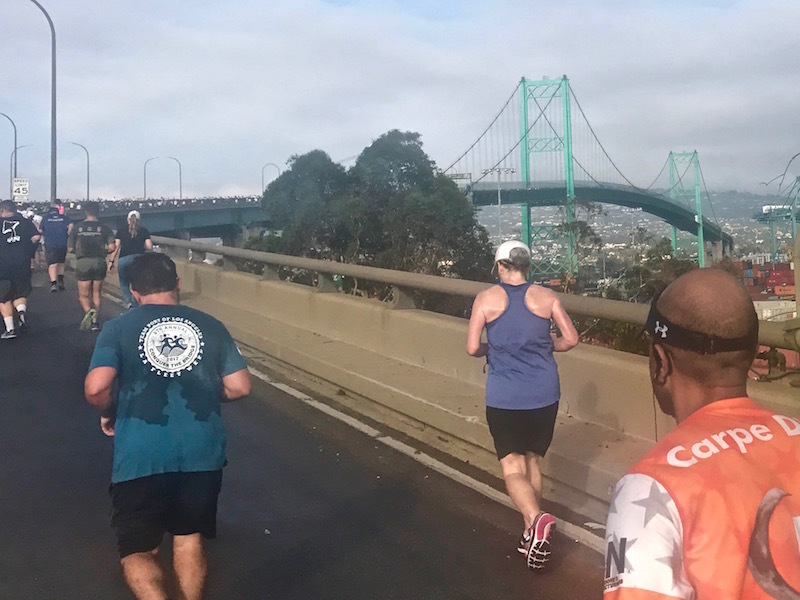 Since the run starts on a road just feet above sea level, it means that competing in this race involves basically running up a 185-foot hill… in the form of a bridge. 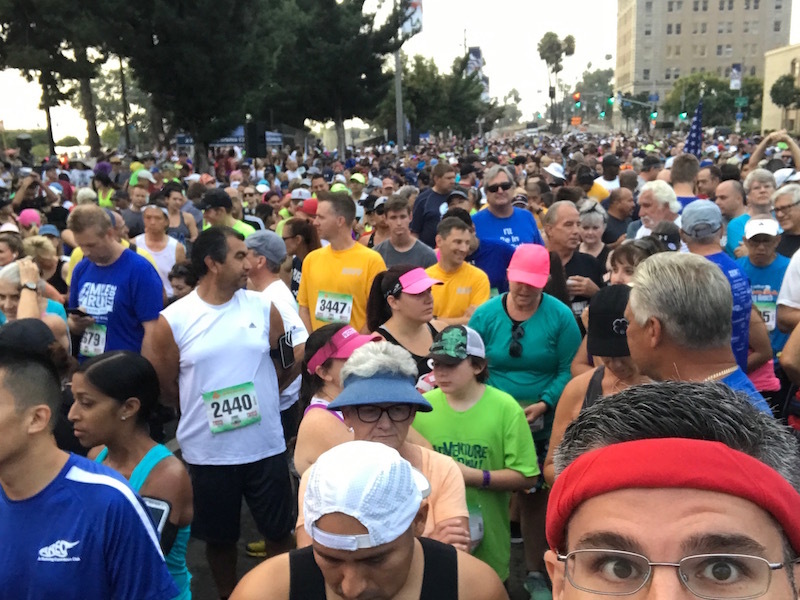 The start line is on Harbor Boulevard, a few blocks from the bridge, next to the USS Iowa, a battleship that’s now a museum. 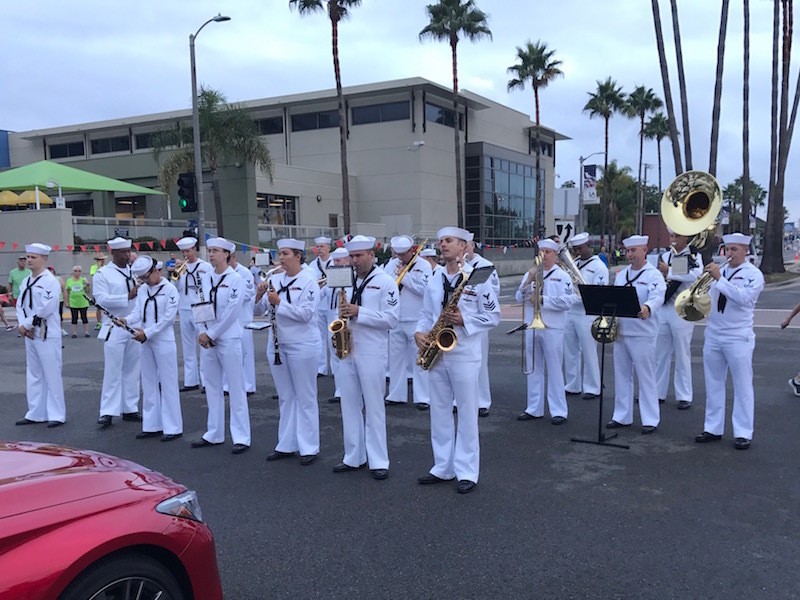 The Navy Band was there, playing music before the race, as well as the National Anthem, and they sounded great. It was a huge event – the announcer said that 4,000 people had registered. And as we all gathered, waiting for it to begin, it sure felt like a huge crowd! At around 7:40am, they rang a maritime bell, and we were off. 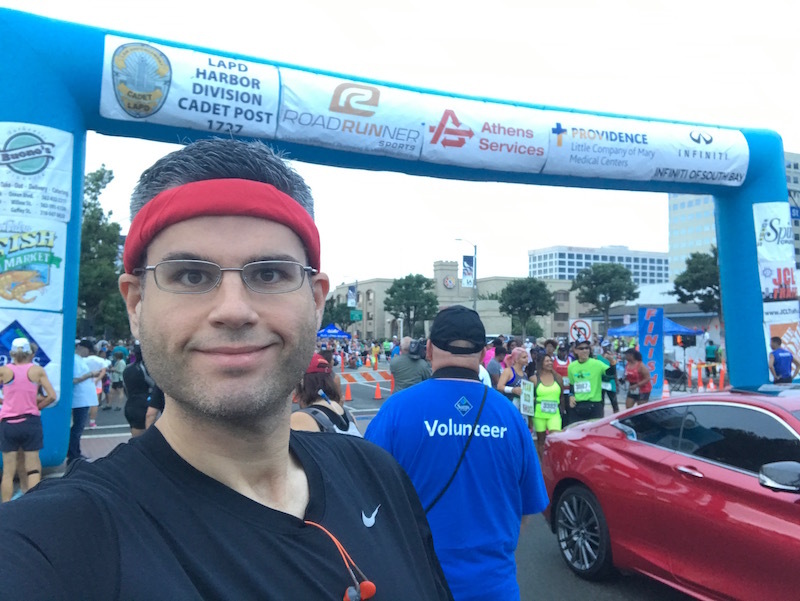 The first mile or so was along Harbor Boulevard, and it was nice and flat. Then we made a left turn onto an on-ramp, and the incline began – time to tackle the bridge! Seeing that bridge looming in the distance was both awe-inspiring and daunting, and the sun was still so low that I wished I had worn my sunglasses. The other thing that distracted me from the other runners was the view. I made my way to the outside lane as I got higher on the bridge – I didn’t want to miss any opportunity to soak in my surroundings! Unfortunately, it’s not a terribly compelling area. 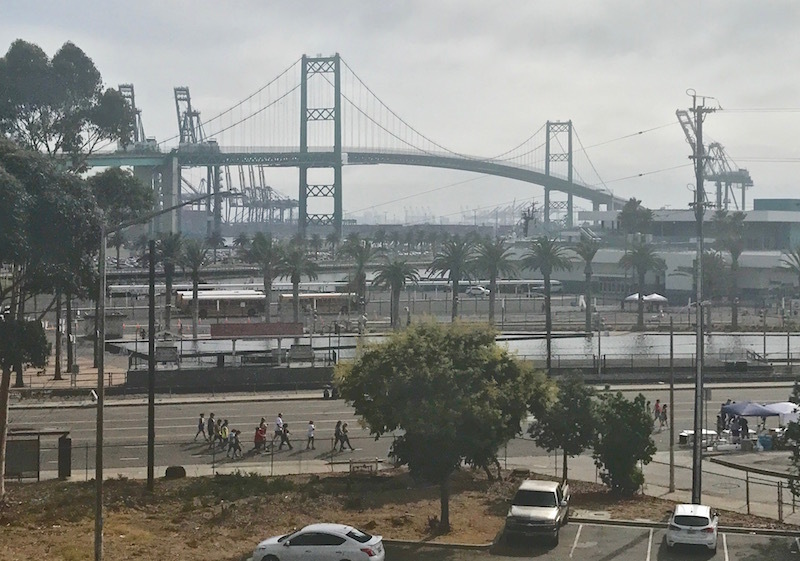 The Port of Los Angeles is the largest port in the country, and while the water is nice, this bridge also rises above mile after mile of stacked shipping containers, cranes, parking lots, and train cars. My favorite moments were when I was running under the towers, stretching up 365 feet above the water. You know the old saying “What goes up must come down”? It’s especially true of a bridge run. 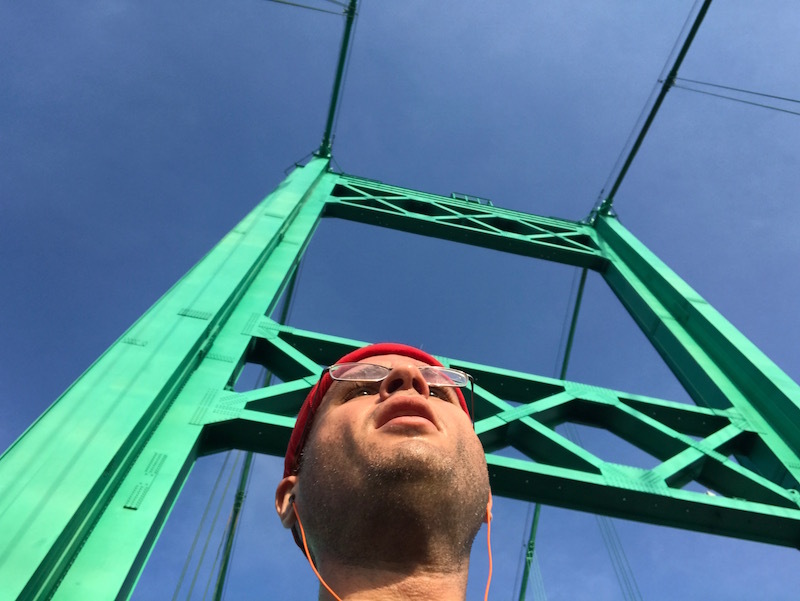 Once I reached the crest of the bridge, the long incline turned into a long decline, and while that’s not as taxing on your heart or lungs, it’s tough on your joints and you still gotta pay attention. We kept running until we got to Navy Avenue, and then… we turned around and headed back. Oh, did I forget to mention that the route involved running the bridge TWICE? 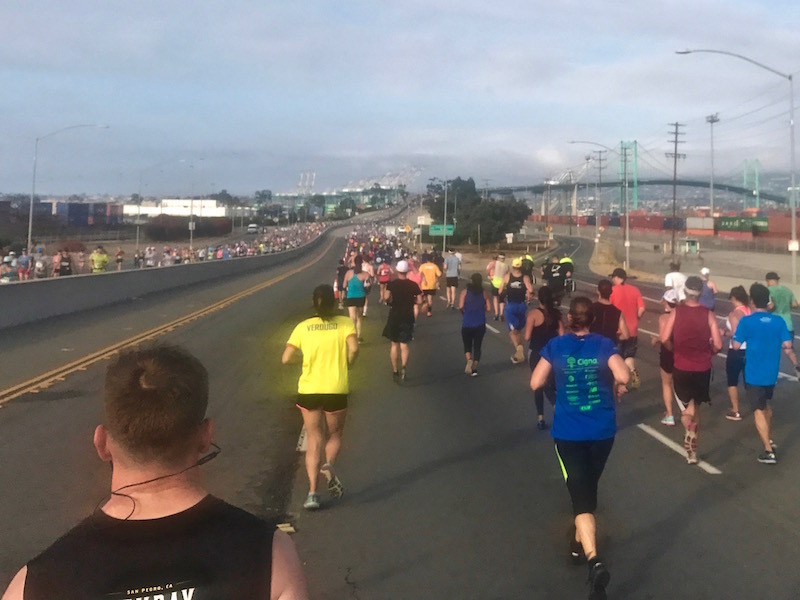 My favorite view of the whole morning was just after the turnaround, with the bridge in the distance, and both sides of the road completely full of runners. Being a part of such a massive group of people, all doing something wonderfully active and physical, really motivated me. By this point, I needed that motivation. I was tired and achy, and only halfway done, and with another giant hill looming ahead of me. And then I started passing people again, on the slow climb up the bridge, and that helped push me to keep going, too. My first Conquer the Bridge was OVER! The race was 5.3 miles and my official time was 55 minutes, 42 seconds. 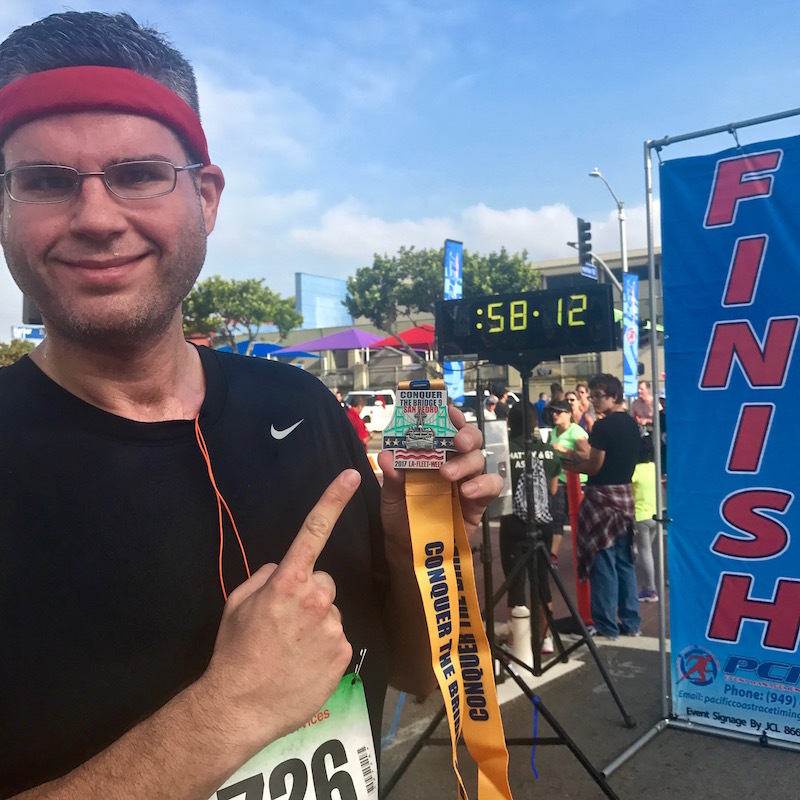 There were 3,305 finishers, and I came in 609th – top 20 percent! I was also the 428th male (out of 1,291), and 124th out of 270 in my age group (men 30-39). And now I have a bridge run under my belt! Los Angeles isn’t exactly a city known for bridges, so I’d have to travel elsewhere to do another one, but I love, love, LOVE the feeling of accomplishing something like this at a major landmark. 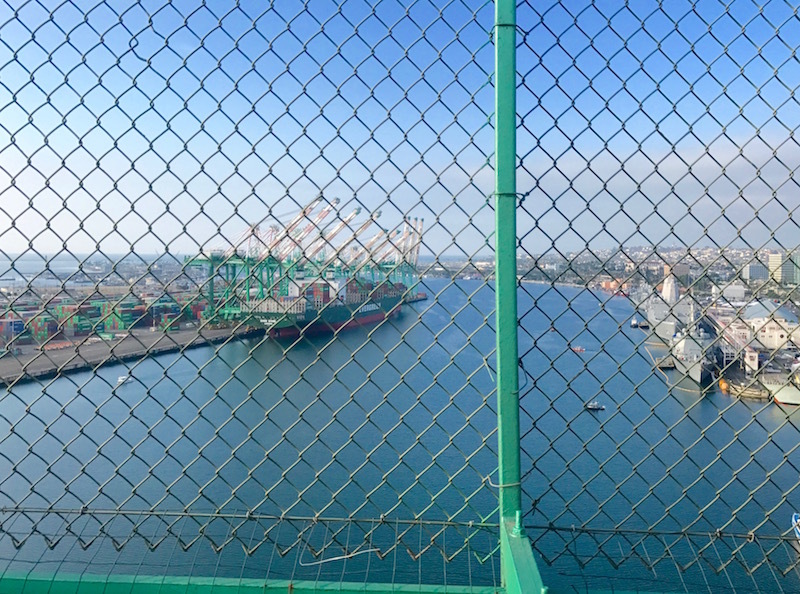 Now, whenever I see or drove over the Vincent Thomas Bridge, I can celebrate the fact that my feet have trod that road, 185 feet above the harbor, surrounded by steel, cables, and pavement, with nothing but sky, water, and shipping containers in all directions. I will feel proud in that moment, just like I feel right now. And that’s an incredible feeling! This entry was posted on Monday, September 4th, 2017 at 10:58 pm and is filed under Uncategorized. You can follow any responses to this entry through the RSS 2.0 feed. You can leave a response, or trackback from your own site. What an awesome opportunity. You-all had the entire bridge, both sides! I am so glad I kept reading long enough to get down to this post. Great pictures too. Thanks.